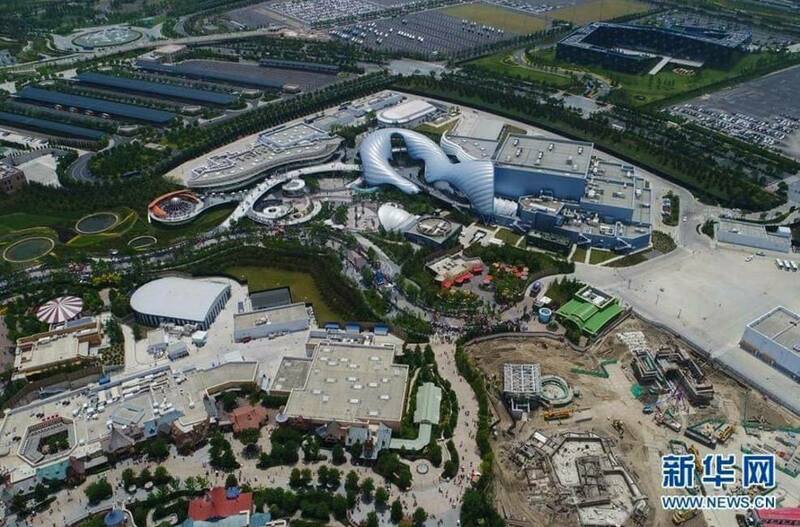 Thanks to Chinese media news.cn we have the first aerial pictures showing the construction of Toy Story Land at Shanghaî Disneyland. First, as we know, the land is located between the TRON Lightcycles show building and the Evergreen Playhouse where is currently playing the Frozen show. 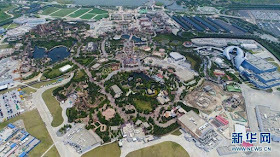 See picture below before TSL construction began. 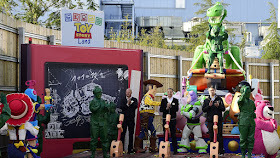 As for the attractions that SDL guests will find in this mini land, Toy Story Land will include Slinky Dog Spin - identical to the one at DLP WDS and HKDL Toy Story Lands, Woody's Round-Up which seems to be the same kind of ride like the Mater's Junkyard Jamboree at Disney's California Adventure, and Rex' Racer who could be like WDS TSL RC Racer. 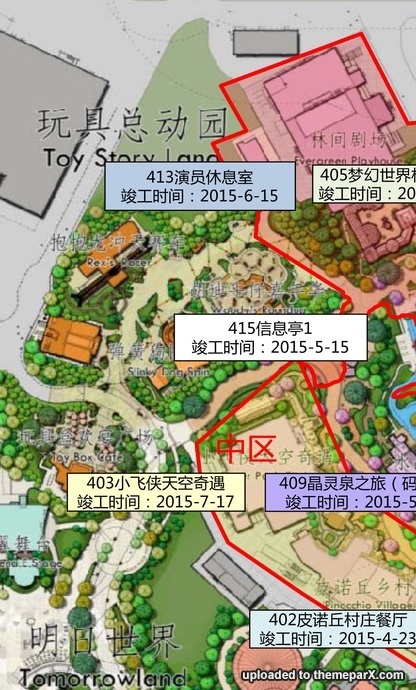 In addition, the land will include the Toy Box Cafe restaurant, in fact already open since SDL opening last June. Now, let's have a look to these aerial pictures showing SDL Toy Story Land construction from above. On the first picture below the park entrance is in the background, SDL Fantasyland in the foreground, and the future Toy Story land on the bottom right. 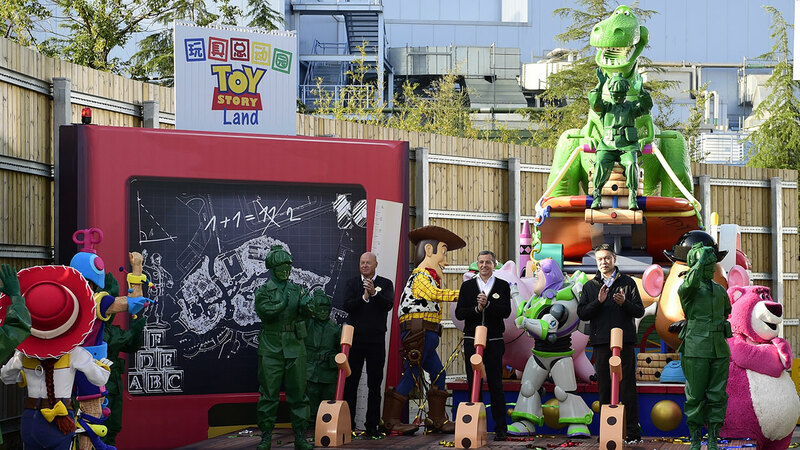 The second picture is a closer view and Toy Story Land is, again, on the bottom right. 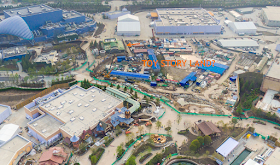 The green building are rest rooms, on the left of it with the orange umbrellas you have the Toy Box Cafe (both are already open ) and below the green building you have on the left Slinky Dog Spin, in front of it Rex's Racer and, under Slinky Dog Spin, Woody's Roundup.